Many of our beloved neighborhoods have a "Taste of ..." event each year. Each of them are always quite nice (albeit a little bit pricey). Beacon Hill is having their 9th annual Taste of Beacon Hill event tomorrow - Tuesday May 12th at the Liberty Hotel starting at 6:30pm. Lots of great restaurants will be there. My favorites of the bunch: No. 9 Park, Lala Rokh, and Scampo. Click (here) for the complete restaurant list and to get tickets. 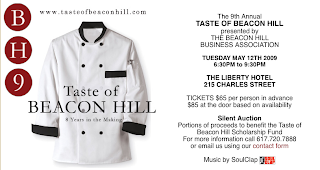 0 Response to "9th Taste of Beacon Hill - 5/12"